"Vacuum insulation mobile mug", is the 21st century version of the thermos that was invented by an English scientist James Dewar back in 1892 and was merchandised and spread all over the world by a German called Reinhold Burger in 1904. In recent years, due to growing concerns towards environment and energy conservation, there have been various discussions about the ways of plastic bottles and the electricity consumption of vending machines. This had led to the increase in number of people using their own bottles, and this product has high expectations of becoming a common product that matches these lifestyles. The features are the easiness to hold and the ability to open and close the lid with just a touch. Thanks to the wide opening, it is very easy to drink and also easy to put a bigger sized ice cubes. 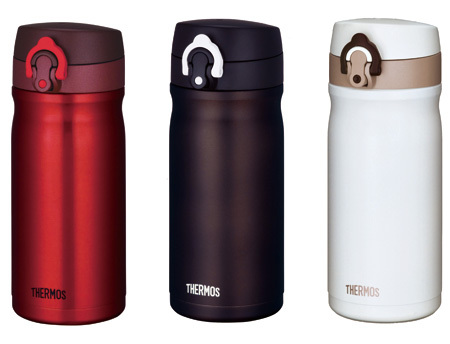 Therefore, it is very well equipped with the original functions of thermos, which are "to drink" and "to supply with beverages". Also from the maintenance point of view, it is very easy to wash, thus easy to keep clean. As for the design, the affordance that leads the natural operation of buttons and locks, and the modeling of a "subtle constriction" for ease of handling can be highly evaluated. In other words, it can be said that it realized the compatibility between functionality and unique shape. It goes without saying that this product gives no out-of-place feeling when using in everyday life. Furthermore, an idea unique to Japan is integrated, which is "to carry around the comfort", and is finished as a product that meet the needs of time where a sustainable planet environment is being questioned, and gives the feeling of ""superb-ness" and "extremity".